Widely acclaimed among the greatest soloists in gospel history, Clara Ward was also the subject of much criticism from purists - with her backing group the Ward Singers, she pushed gospel out of the church and into the nightclubs, infusing the music with a shot of glitz and glamour the likes of which had never before been seen. Decked out in colorful gowns, towering wigs and dazzling jewelry, the Wards sang only the biggest pop-gospel hits, flamboyantly delivered for maximum commercial appeal; while many observers decried their clownish onstage behavior as demeaning not only to the music but also to their African-American heritage, at their creative peak the group was a true phenomenon, combining superb soloists, exceptional material and innovative arrangements to leave an indelible mark on the generations of spiritual performers who followed. Born in Philadelphia on August 21, 1924, Ward was unquestionably the driving creative force behind her group's success, but the business smarts belonged to her mother, Gertrude Mae Murphy Ward. The textbook stage mother, Gertude and her husband relocated to the Philadelphia area from a life of abject poverty in rural South Carolina; the family struggled throughout the Depression, but in 1931 she was struck by a vision which commanded her to begin a singing career. Forming a family group which included Clara and her sister Willa on piano, Gertrude quickly emerged among the most forceful promoters in all of gospel - a gifted vocalist in her own right, her truest talents were nonetheless of an entrepreneurial nature, and after a transcendent performance at the 1943 National Baptist Convention, the Ward Singers were one of the top attractions on the church circuit. The Wards' success, however, did not come without a price - Clara, the star of the group, later admitted to constant frustrations with her life as a teen phenomenon, and although she loved gospel, it appears unlikely that she would have pursued a singing career if not for the constant pressure applied by her mother. 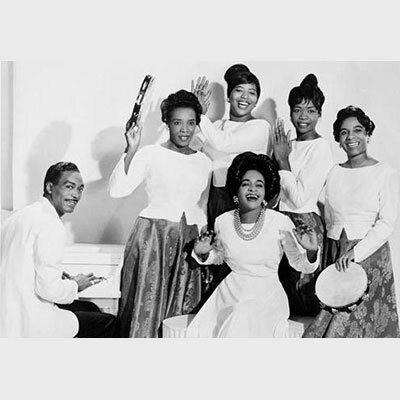 By the late 1940s, the group had grown so successful that they added a pair of new members, Henrietta Waddy and Marion Williams, a Miami teen whose powerhouse voice became the Wards' trademark. With Williams installed as soloist, the Wards hit their creative peak, issuing such masterful hits as "Surely God Is Able" and "Packin' Up." For her part, Clara remained content to remain somewhat in the background, accompanying the group on piano while Williams stole the spotlight. While her gorgeous alto was the centerpiece of hits like "How I Got Over," arguably Ward's greatest strength was as an arranger; "Surely," the group's biggest hit, even introduced a new waltz rhythm into the gospel lexicon. The Wards - who by now also included Frances Steadman and Kitty Parham - were also the first gospel group to employ the switch-lead style of the shouting quartets, always keeping at least four vocalists in their ranks at all times. The consensus pick as the best hymn singers in the business, the Wards also rejected the homespun choir robes of the past in favor of elaborate costumes - according to legend, on one occasion their infamous wigs grew so tall that they actually touched the ceiling. Throughout the 1950s, they were among gospel's elite, scoring more hits and making more money than any group before them. During the early 1950s, the Wards began regularly touring with the Reverend C.L. Franklin of Detroit; the father of Aretha Franklin - herself an admitted disciple of Clara Ward - he was a gifted singer and preacher in his own right, and as his star rose the group's fame continued to grow. However, in 1958, Williams quit, and the bottom fell out - Parham and Steadman exited as well, all over their notoriously low salaries, and although new recruits including Thelma Jackson, Carrie Williams and Jessie Tucker were quickly brought in, the Wards' popularity nosedived. By 1961, amid considerable hoopla, they moved to the club circuit, playing Las Vegas and even Disneyland all to the shock of gospel traditionalists; white audiences were intrigued, and the group continued touring throughout the 1960s, until Ward's declining health forced her into retirement. She died January 16, 1973.